My husband and I do not have a perfect marriage, but we are perfect for one another–lol! After many years of marriage and 9 years of dating (long story), I still have the hots for my husband. We have an occasional squabble here and there, but I’ll be very honest and upfront with you, we do not argue about money. Although, it wasn’t always that way. My husband and I have worked through our differences about money over the course of our marriage. We started out as a two income marriage and transitioned into self-employed co-business owners just a few years after we got married. We continue to work together. Side by side. At work. So yeah, we’ve had our money arguments. But over the years, we’ve figured out a way to compromise, agree, and join forces when it comes to our money. For this reason, I have put together a list of ideas that I think contribute to my marriage’s current lack of money squabbles. Money tension is one of the leading causes of divorce. The stress could come from unemployment, a large debt load, feelings of inequality, or the amount of shoes in someone’s closet–money can be an evil force in a marriage. 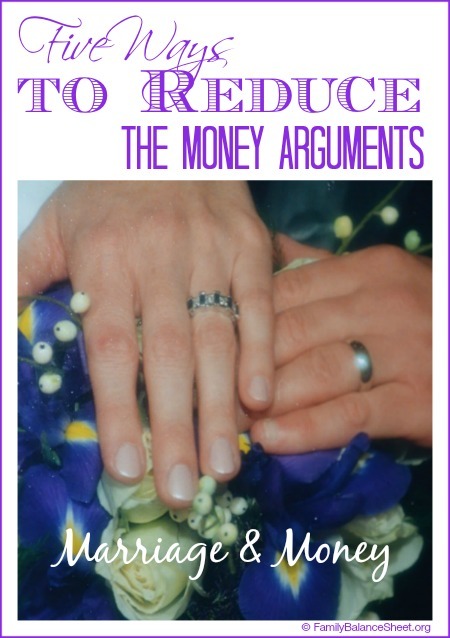 Whether or not your marriage is struggling over money issues, I hope you find these tips helpful. In my house, I’m the Family Office Manager (FOM). No surprise there; I write a blog about family finances. But I also want to be the FOM. I’m the spreadsheet geek in the marriage and the one who loves to analyze numbers. The FOM should be the spouse who has the most interest and drive to perform the tasks. The tasks might include track spending, reconciling and managing the accounts, paying the bills on time, and updating the Family Balance Sheet. The tasks will vary between households, so devise a to-do list of your family’s financial tasks, so that the FOM knows what is expected of them. The FOM might manage the money, but shouldn’t be the controller of the money. That is a joint responsibility between the two spouses (at least in our home). My husband and I have equal footing when it comes to money decisions even though our small business revolves around my husband’s professional degree. In some ways, I think the fact that I am the FOM and he is the primary income earner helps balance out any feelings of inequity. 2. Complete a Family Balance Sheet on a Monthly Basis. It is not always easy to communicate your current financial snapshot with your spouse, so let the balance sheet do the talking for you. I developed this spreadsheet years ago, as a way to communicate our finances with my husband. It’s all there in black and white; there’s no denying it or running from it. The spreadsheet is a FREE download, just head over to the Family Balance Sheet post for more details. Take some time to discuss your family and marriage’s financial goals. We have found that there is less tension when we are both on the same page, but you need to take the time to discuss those goals together. Do you want to eliminate your credit card debt? Or buy a home? Or save money for a trip to Walt Disney World? Be realistic, but dream a little too. Write down your goals and make them visible. There is space at the bottom of the Family Balance Sheet for your financial goals. We put together a very detailed Debt Freedom Plan a few years that we refer to often when making money decisions. 4. Meet Regularly to Discuss Finances. Check in regularly with one another to discuss any upcoming expenses, cash flow, and goal updates. This will keep you on the same page and marching in the same direction. Meeting regularly could be every Sunday night or every pay day, whatever fits your schedule. If possible, make it a kid-free meeting. For us, it’s not always possible to find some child free time on the weekends and when the kids finally get to bed at night, we’re usually in a brain fog from a long day at work. Our kids sense that mommy and daddy are having a serious conversation and quite suddenly they want to sit on our laps, need a snack from a high shelf, or have a very important secret to whisper in our ears. Basically, our kids want our attention and they don’t like the fact that they aren’t getting it. One solution we have found is to set them up with a movie and a special snack, like popcorn. That usually gives us enough time to meet. In other words, you might need to be creative to carve out the time to meet regularly. Make a promise to not raise voices. Be honest with each other about the state of your financial affairs. Own up to any financial indiscretions. Work through disagreements civilly and move forward. 5. Consider an Adult Allowance. This is somewhat controversial for some marriages, but this tip is probably what has eliminated most of our money arguments. We started an adult allowance a few years ago when I noticed that I, as the FOM, was getting frustrated by our discretionary spending. We have a budget for items like clothes, hair cuts, and miscellany, but I felt like I was getting blind sided by some purchases and my husband felt like I was watching his spending like a hawk. I didn’t like the feeling of being a mother hen and I knew he wanted a little breathing room. The solution: we each opened up a checking account for our own personal spending. The accounts are to cover the personal categories that caused the most tension, such as clothes, hobbies, haircuts, and other miscellany. We came up with a dollar amount that fit into our budget and on the first of every month that money is transferred into our individual accounts. Now if there is a personal purchase that we would like to make, such as a new coat or new shoes, it is up to us, individually, to save the money, manage the money, and budget the money. No questions are asked, it is our own personal stash. I am not a therapist, but I am a wife who wants love and respect to be the center of our marriage, not money and the incendiary arguments that it can cause. Money is necessary, but it doesn’t have to be evil. It will only cause tension if you let it. 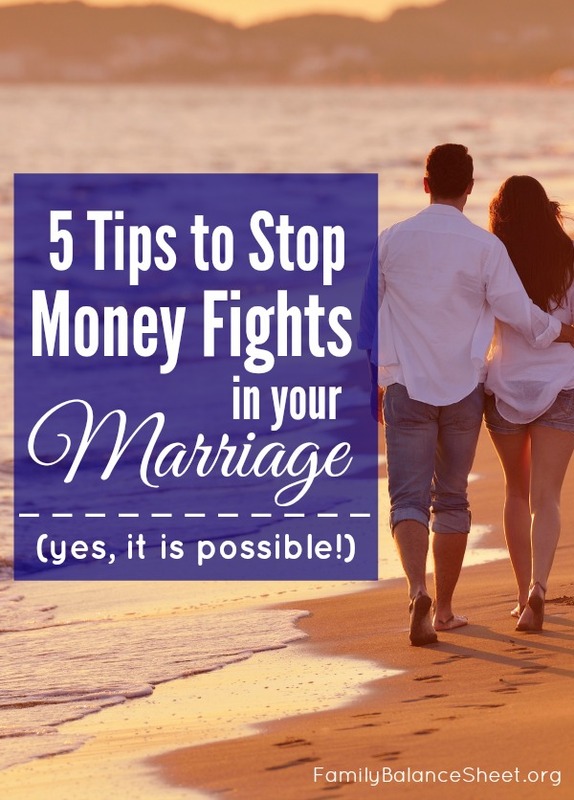 Set your marriage up for success with these 5 steps to reduce the marriage arguments. Does money cause tension in your marriage? How have you worked through money issues in your marriage? What advice do you have for other couples having money arguments. Please let us know in the comments. Nice list of tips for helping with the stress over finances. My wife and I have taken turns on the family office manager / family CFO a couple of times. I’m currently doing the bulk of everything right now. She did it for quite some time prior to me, but when I started setting up online bill pay, she didn’t want to do any of the finances. We’ve gone back and forth on the allowance, but mainly because it’s usually one off things, and neither of us have particular extravagant tastes, so we just dropped it. My husband and I aren’t particularly extravagant either, but having separate accounts for some of our spending categories has eliminated a lot of tension. Thanks for commenting. This is a great article. We also do each of these five items, although we have slightly different variations of each tip you gave. I honestly cannot even remember the last time my wife and I had an argument about money. Of course we often have differences of opinion about money, but we talk about these differences in such a positive way that to an outsider, I’m sure it appears more like a discussion than a disagreement. Having said all that, I acknowledge this is not terribly difficult if you and your spouse have similar basic values about money and you’re just trying to work through the details of life. It’s got to be really tough for couples who have nearly opposite financial viewpoints. You make a great point about couples with having similar values about money. Thankfully, my husband and I have very similar viewpoints on money. It wasn’t always that way though and I think having set financial goals keeps us both on the same wavelength. Thanks for commenting. Honesty really goes a long way to not having arguments about money. Love that I found your blog! As a recently engaged woman, who is definitely the FOM of this household, I’ve been trying to find a way to discuss finances with my pre-husband. Finding a way to combine our lives, yet keep individual identities financially has been a struggle for me to figure out. I love the way you’ve outlined solutions to problems that I worry may come up. Thank you for this great article! Holly – I got married at 31, so I totally understand where you are coming from with keeping your financial identity, but combining your lives. It is so important to start having financial conversations before you get married, so there are no surprises after the wedding. Good Luck and Congratulations! Hi Brittany – we had those same arguments in the beginning too before we became more diligent about our meetings. Isn’t it amazing how communication prevents arguments?Thanks for your comments. Funny how relationships can resemble a business where money is concerned. It is interesting, I have two friends that kept their finances separate when they got married and they were always very open and proud of that fact. In the last 2-3 years, they both went through very bad divorces. I’m not saying that was the primary reason, but I think that was definitely indicative of a larger issue. I think you really need to combine your accounts and tackle savings/debt as a team to be successful. I wish it worked this way. I’m the one who makes our single income and he refuses to watch his spending. Any tips on single incomes?